When it comes to introducing your kids to mathematics, you have a slew of options to choose from. One that I personally recommend is a toy cash register. Not only does it help children get a good grasp of math, but it can also help develop their ability to be responsible and manage resources as they grow older. The best toy cash register in the market today can do those things while also stimulating their imagination as well. With that, I’ve made a short list of the best toy cash register for kids that are available today. This is honestly a smart educational toy that you should consider for your child during their developmental stage. It can help remove that “math-phobia” our generation had when we were toddlers. 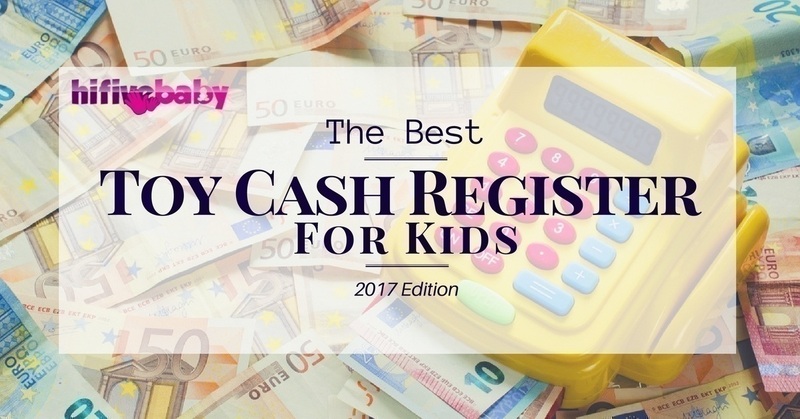 So, let’s get right through the list of the bestselling toy cash registers and then let’s discuss the benefits this toy has for our kids. If there’s one thing that entices me towards the Pretend and Play Calculator Cash Register is that they have built a solid reputation in children’s toys. I still remember having one as a kid and also remembering how much I enjoyed imagining being a shopkeeper selling imaginary items to my playmates. This is also why I chose to get this for my kid. You can chalk it up to nostalgia, but the fact is this is a high-quality educational toy. It comes complete with plastic toy currencies and a fun little plastic credit card and credit card reader. You might also be glad to know that this one is solar powered so no regularly replacing batteries. The buttons are responsive, and the drawer can be easily opened and closed. I also love the authentic cash register bell sound whenever you open the register. In my honest opinion, I think this is the toy cash register that you need to check out for your kids. Near authentic cash register operating. Simulates the process perfectly while still making it fun. Gender-neutral color makes it great for both boys and girls. Solar powered which eliminates the need to change batteries. Large brightly coloured and responsive buttons. The drawer opens surprisingly fast which is something you need to be aware of for safety. A great alternative is the Casdon Mini Market Cash Register. While it does have its shortcomings, its overall design and feature help counter the downsides. It can help improve cognitive abilities of children by allowing them free reign on hypothetical situations thanks to Casdon’s essential accessories that come with the toy cash register. The Casdon Toy Cash Register comes with a variety of toy products that you see in grocery stores. It also comes with plastic coins and paper money. The calculator works well enough, but Casdon’s real strength lies in its ability to deliver a nigh authentic feel which is great for make-believe games for your children. Comes with a variety of accessories such as toy food products. It also comes with a compartment for these items. Delivers an excellent authentic feel, great for cultivating children’s cognitive abilities. Compact size makes it easy to carry around. The overall durability of the toy is a bit questionable. If you want something on the more affordable side, you might want to check out Little Tike’s Count and Play Toy Cash Register. It’s an ideal cash register toy for children ages 2 to 5 years old. As you might expect, this toy cash register doesn’t have the most authentic feel and instead goes to a more child-friendly design using bright colours. This toy has three coloured coin slots that can help improve the child’s memory and recognition skills. It can also help them test their problem-solving skills as well. Once all three columns are filled correctly, the drawer will open allowing your child to take out or put in plastic coins. It also has a cashier bell ring when your child pulls the lever which is a nice simple touch. As you might expect from a toy that caters to ages 2 to 5 years old, this one mostly focuses on visual stimulation. It can help teach your child colours, shapes, and sizes specifically. It uses bright, friendly colours. The handle produces a cashier bell sound. A nice touch. Definitely one of the more high-end toy cash register I’ve seen in the market. It features every element of a toy cash register you need and comes with several toy accessories as well as an open and closed sign, plastic coins, receipts, plastic credit cards, and play money. The biggest draw of this toy is its multi-language feature that allows children to choose between English, Spanish, and French voices for the computer. I actually recommend this for classrooms as well. The toy comes in gender-neutral design making it great for both boys and girls to play with. Oh, I should also point out that it requires 3 AA batteries to operate. Comes complete with various accessories to give children a near authentic feel during play time. Can actually hold life sized money. This toy cash register utilizes a simulated LCD screen to help your child learn about basic math and colors. It does so using an interactive menu that lights up at the touch of a fingertip. I liked how it utilizes songs to teach kids about numbers and colors. You can swipe toy accessories that come with the product into a scanner which would then indicate the “price” of the toy to simulate modern cashiers. This is a pretty nifty toy cash register that is perfect for children under 5 years old. The smiley face that appears on the simulated LCD should also help your kid feel at ease when playing with the toy. All in all, a decent toy cash register that captures the automatic functions of today’s cashier. It uses different songs to help teach children the basics of numbers and colors. Utilizes a simulated LCD display instead of tactile buttons. Be careful when inserting the coins while the drawer is closed as it has a tendency to get stuck. Chances are you’ve already heard of VTech and know that they are well-known when it comes to education toys for toddlers. The VTech Ring and Learn Cash Register continues this trend and is a perfect toy for young children between ages 1 and 3 years of age. One of the best features included in this toy cash register is the inclusion of around 80 different children’s songs, tunes, phrases, and sound effects. If you have a young toddler that is still in the developmental stage you might like to give this one a whirl as it can help develop your child’s visual and auditory perception. Fun and interesting with a multitude of tunes and sound effects for toddlers to play with. When it comes to educational toys for toddlers I always opt for one that don’t perfectly capture the look of an actual of the item they are simulating. This is because it’s important to leave something to the imagination of the child to help stimulate growth in this area. By leaving some space between a toy and the real thing, you can let your kid fill in the blanks with their imagination. This can help sharpen a child’s cognitive ability while also helping them learn the basics of mathematics and resource management. It’s pretty simple really, if you have a child who is at the tender age of 2, you can’t give them a toy that is above their current skills. I suggest you focus on visual educational toys for children under the age of 5. I’ve included a toy cash register that fits this category perfectly above. It uses shapes, colors, and sizes instead of numbers. This is, of course, the final factor but is just as equally important as the previous two. Safety is vital for your child. Does the toy cash register have small parts that your child might accidentally choke on or swallow? Is it made of safe material with no traces of harmful chemicals? Always take the safety of your child into account when giving them a toy of any kind. The construction and material are two important aspects you need to know about before making a purchase. 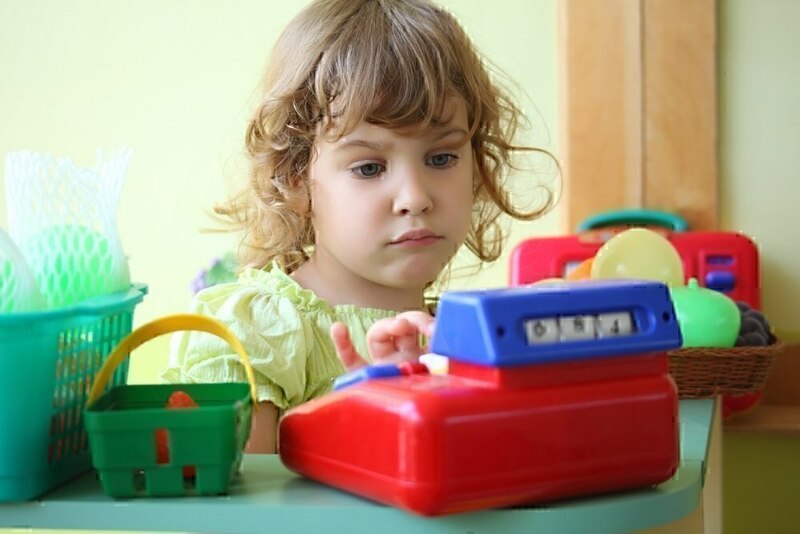 The biggest benefit of giving your child a toy cash register is not just that it introduces them to mathematics, it also helps them learn how to be responsible and manage resources at a young age. It is a far different generation that kids are ushered in today compared to a decade or so ago. Having them learn the value of managing money is a good trait to groom at an early age. Help your child set a goal they want to achieve within a certain time frame. A fun little daily budget plan should help smooth things. Make it fun and engaging and make sure the goal is something your child truly wants. Once done playing with their toy cash register you can help them count their “earnings”. At the end of the challenge, you can have them give you the pretend cash they saved and give them a reward. Make saving fun for your kid. Give them a cute piggybank or maybe help them make a savings jar. Helping them learn that saving is fun is an important aspect you should always include. Help your kids in their savings by contributing. This will help fuel their drive to save money even further. For example, if they were able to save $15 in a week, add another $15 in there from you as well. Think of it as an incentive for them to save money. Be a role model! Simply put, if you want your child to be able to manage money and save properly, you yourself must set an example. Practice what you preach. 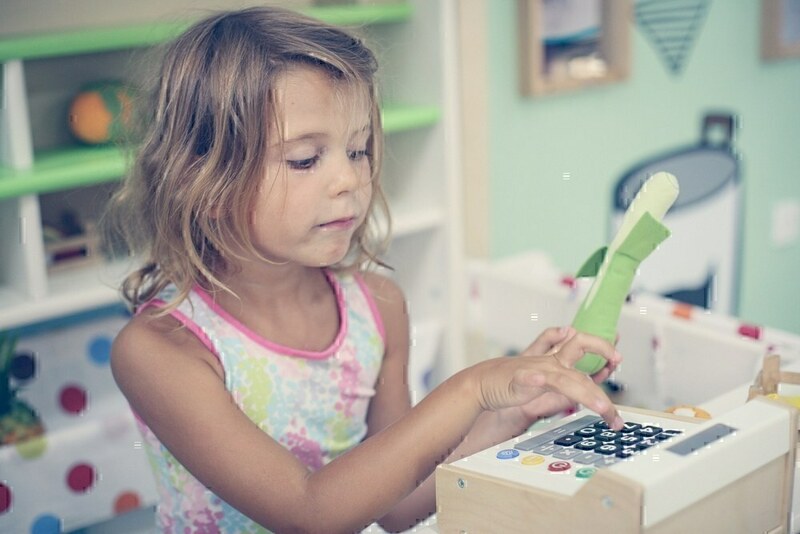 Educational toys are imperative to your child’s development and toy cash registers not only help them learn basic math but also help introduce them to saving and budgeting money. Taking all of the important factors above into consideration, I would personally recommend that you check out Pretend and Play Calculator Cash Register. It features a nice balance between realism and toy and a nice assortment of accessories that can help enhance your child’s cognitive skills and get their imagination muscles flexing. Do you think there are other benefits in having your child play with a toy cash register? Maybe you have your own recommended toys? Comment down below and join the discussion. I hope this little article helped in guiding you choose some quality toy for your little bundle of joy.